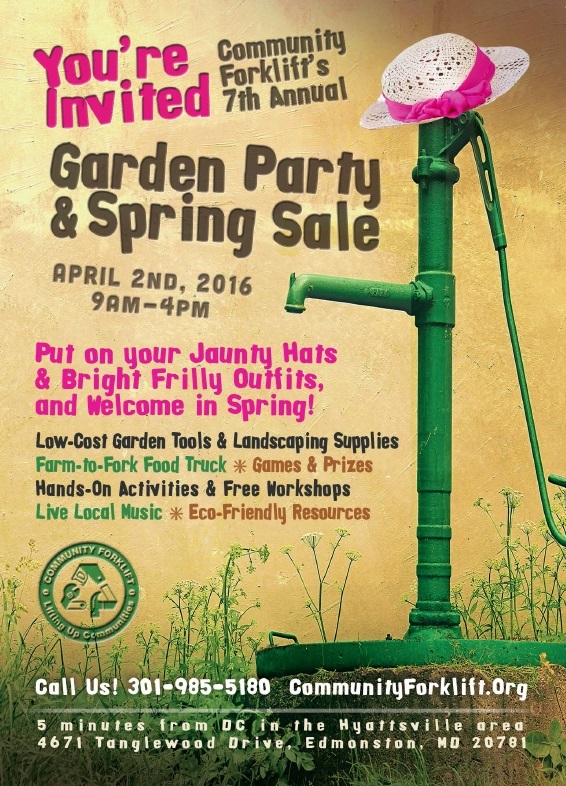 Spring is coming, and so is a great local event: the Community Forklift Garden Party & Sale! Throughout the winter, the nonprofit collects gently-used and surplus lawn & garden supplies as well as outdoor décor and furniture. They will put it all out for your shopping pleasure on April 2nd. The sale begins at 9:00 am on April 2nd, but some folks start lining up outside the gates even earlier, eager to dig through piles of flowerpots and shovels. It is Community Forklift’s biggest fundraiser each year; proceeds support their work to create green jobs, reduce waste, educate the public about reuse, and provide free supplies to nonprofits & neighbors in need. There will also be fabulous garden décor at Tanglewood Works, the “front porch” of the Garden Party. This unique and whimsical shop at the front corner of Community Forklift offers upcycled & reclaimed furniture, home goods, jewelry and art — all made by local artisans. Where else can you find planters made from recycled toilets and wind chimes made from spoons? The Tanglewood team will have garden-themed activity sheets for upcycling projects that are great for children and adults. They will also display project samples to inspire you to create your own “funky junk” garden decor with recycled materials. Then, the party gets started at 10:00 am, with free gardening demonstrations, local experts, activities for kids, live bands, and a farm-to-fork food truck. Put on a fancy hat, a seersucker suit, or other garden party attire – there will be prizes for people and pets in costume! ECO City Farms will offer great seedlings, already sprouted and ready to go right into your garden. Hyattsville Horticulture Society will be selling vegetable, flower, and herb seeds; along with some helpful gardening books. Little Red Bird Botanicals will have handmade herbal products including salves, infused vinegars, loose tea, and tinctures; sign-up for classes and an herbal CSA, too. The Farm Effect is a delicious farm-to-fork food truck with options to please meat-lovers, vegetarians, and kids. So round up your friends, start planning a stylish garden party ensemble, and mark your calendar for Saturday, April 2nd! Community Forklift is located at 4671 Tanglewood Drive, Edmonston MD 20781 (just a few minutes from Hyattsville). Parking is limited, so carpooling or biking is encouraged. Questions? Contact Outreach(at)CommunityForklift.org or 301-985-5180. Next Next post: Cottage City Garden Spring Opener!